Oktoberfest is the biggest beer festival on the planet and has a long history dating back several centuries in its home nation of Germany. Held each year in the Bavaria region of Germany, Oktoberfest runs from the end of September through into October and attracts millions of visitors from all over the world with its stalls, games, rides, food, dancing, singing, and huge quantities of beer. It’s an amazing event that has been adored by multiple generations, but you don’t have to fly all the way to Germany to experience the fun and excitement of Oktoberfest. Many different versions of the festival are held all over the globe, including one particularly popular and successful celebration in the Big Apple itself: OktoberFest NYC. New York City is known as being ‘The City That Never Sleeps’, with exciting events always going on, and Oktoberfest NYC is definitely one of the hottest dates on the city’s calendar. 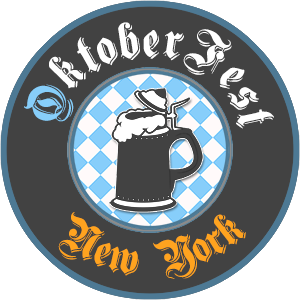 Offering amazing food, fun German outfits, lots of love entertainment, exciting games for all guests to enjoy, and, of course, barrels and barrels of beer, OktoberFest NYC is an amazing celebration of German culture, beer, and general good times. This event was designed with the original Munich Oktoberfest in mind and aims to recreate the same excitement, spirit, and fun of that centuries-old festival right in the heart of New York City itself. It can appeal to guests of all ages and is all about people coming together, having fun, sharing smiles, and making a lot of joyful memories. OktoberFest NYC is held at an amazing 3,500 square foot venue at Pier 15 of Manhattan. Looking out over the East River, with great views of the water and Brooklyn Bidge, it’s the perfect place to soak up the beauty and culture of NYC while also experiencing some overseas excitment at OktoberFest NYC. The event is fully free to attend and features a huge range of games, food and drink stalls, activities, people dressed up in authentic Bavarian outfits, and much more, guaranteed to put a smile on the face of every single attendee. Oktoberfest is most commonly associated with beer, so prospective attendees can expect to see a huge range of beers to choose from at this amazing event, including many traditional German brands that have been brewed for centuries and that are actually served at the original Oktoberfest in Munich. You’ll find the likes of Hofbrau, Weihenstephan, and Radeberger beers here among many others, but beer isn’t the only thing on the menu at OktoberFest NYC. A full menu of snacks will also be available at this NYC event including bratwurst, pretzels, and other traditional treats, so you’ll be able to satiate your hunger alongside a cool stein of authentic German beer. You can actually buy food and beer tickets for OktoberFest NYC in advance of the big event to let you skip the lines and get priority access, letting you quickly and easily access the drinks and snacks you want. 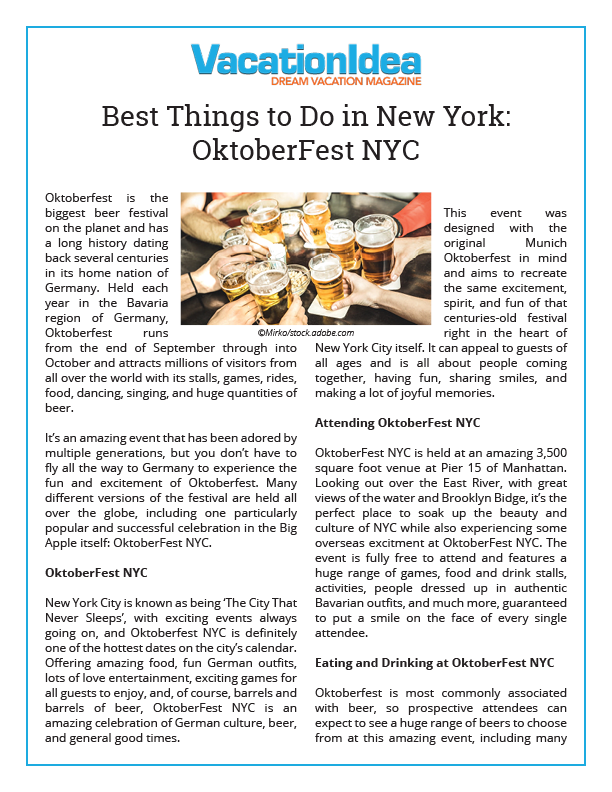 If you’re planning on attending the next edition of OktoberFest NYC and enjoying all the fun and excitement of this amazing event for yourself, there’s some important info to be aware of and a few tips for attending OktoberFest you might be interested in knowing. -OktoberFest NYC is a fully free event, but you do need to reserve a ticket in advance as the event can only allow a select number of guests in and it has proven very popular in the past so could easily be a sell-out. -Attendance is free, but you will need to pay for all food and drink found at the various stalls around the event. Most items typically cost $10 but you can purchase ticket packages which let you exchange little tickets for the food and drink you want. -You’ll find a truly authentic recreation of the Bavarian Oktoberfest when attending OktoberFest NYC. This means that only German beer and snacks are served here and you’ll find traditional games and activities, as well as people dressed up in lederhosen and other classic outfits. -The event will run over the course of four weekends through September and October, giving attendees plenty of chances to enjoy all the fun with their friends and families. -There are no age limits to OktoberFest NYC and the event is designed to be family-friendly, so kids are more than welcome but do need to be accompanied by adults at all times. -Drinking beer is a big part of the OktoberFest NYC experience, but guests are encouraged to drink responsibly and guards will be present to ensure that nobody causes any unwanted disturbances or issues.